What does the Okta integration do? Okta is the foundation for secure connections between people and technology. Okta's IT products uniquely use identity information to grant people access to applications on any device at any time, while still enforcing strong security protections. Okta's Platform securely connects companies to their customers and partners. Today, thousands of organizations trust Okta to help them fulfill their missions as quickly as possible. 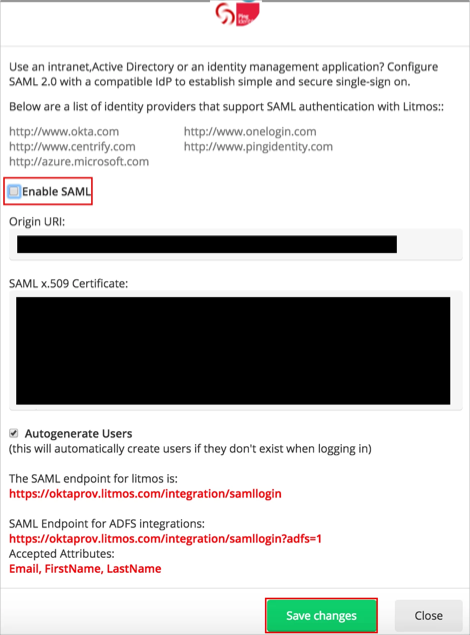 Litmos offers SAML integration with Single Sign On using Okta as an IdP (Identity Provider). 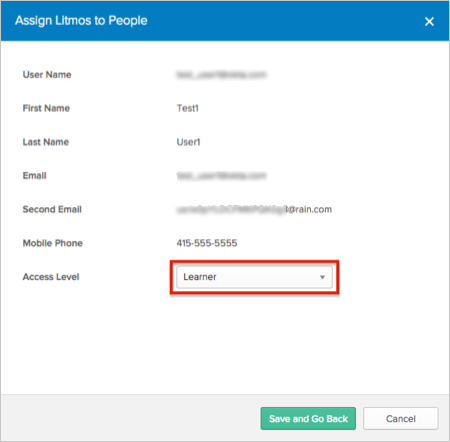 This integration will allow users of Okta to login directly to their Litmos learning accounts and automatically provision new users in the system. Through the use of active directory integration through Okta this will streamline the efforts needed to administer users in Litmos. The steps outlined below will allow for this integration. 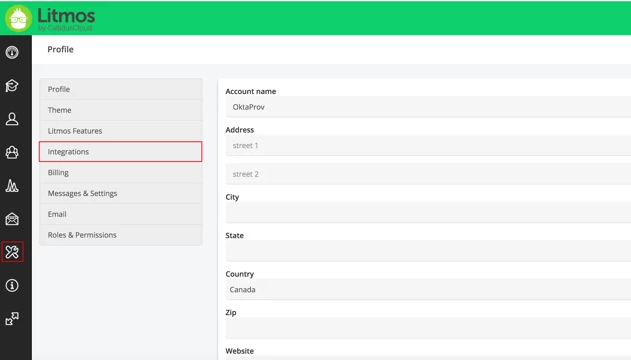 The application label is what displays to end-users when viewing the app in Okta. The login URL is the destination for the user login, which can be a ".Litmos.com" domain or a custom domain. Check your Litmos account to verify the login URL. 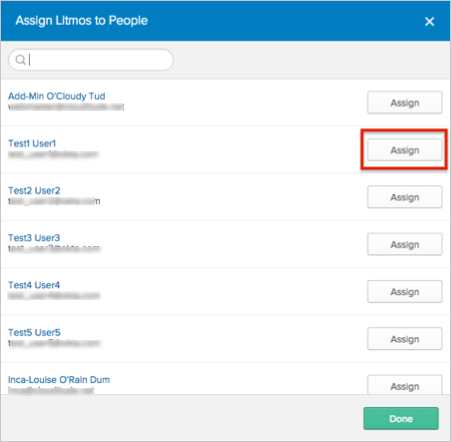 The application visibility is what determines if end-users in Okta will be able to view the Litmos app on the Okta content tab, or add the app to their content tab. 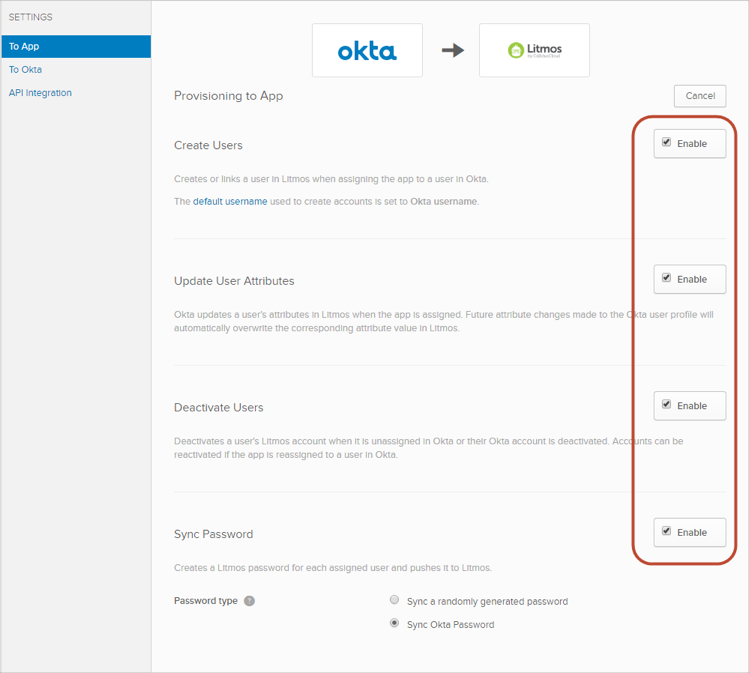 Navigate to the Litmos integration in your Okta admin console, then select the Single Sign-on tab. 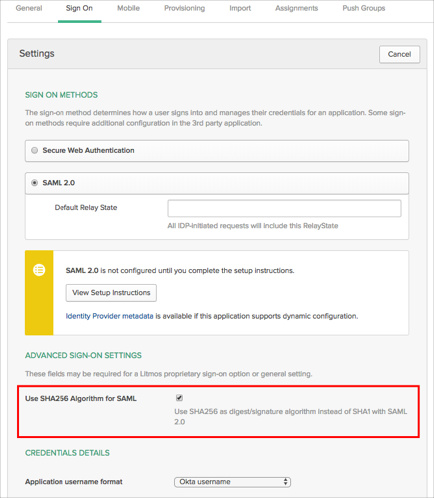 Scroll down the the ADVANCED SIGN-ON SETTINGS section and check the Use SHA256 Signature Algorithm for SAML checkbox. Sign into your Litmos account. 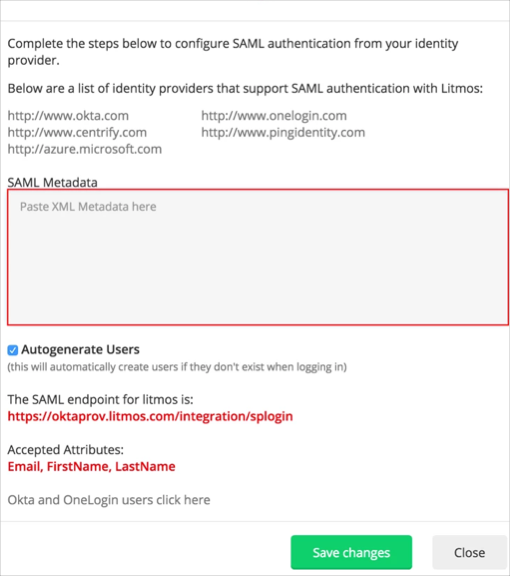 In the window that opens, DO NOT click on the Okta and OneLogin users click here link as this will take you to a set-up screen that uses the old Litmos SAML endpoint and SHA1 algorithm. Okta recommends that you budget 1-2 days for the migration project, including planning, testing, and rollout. Decide on a time you will be performing the migration, and inform end users in advance about the downtime. 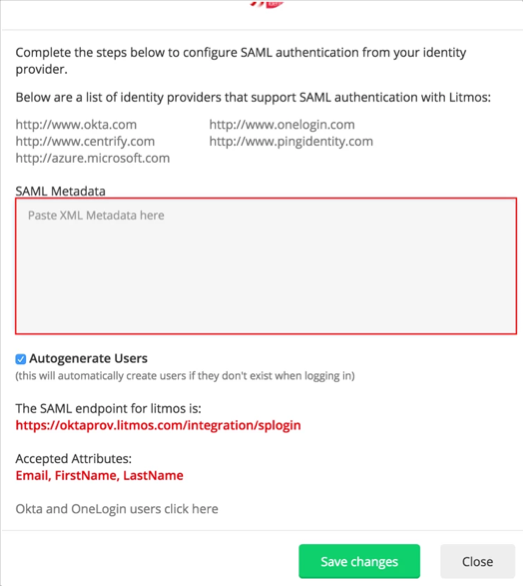 Litmos does not support multiple IdP, so once you switch to SHA2 in Okta, the end users will be unable to log in until you've completed all steps in Litmos as outlined in the migration section below. Find the updated Litmos integration with a self-serviceable option to switch between the two cryptographic hash algorithms. Instead, copy and paste the above generated metadata file into the SAML metadata field. Check the Enable API Integration box. 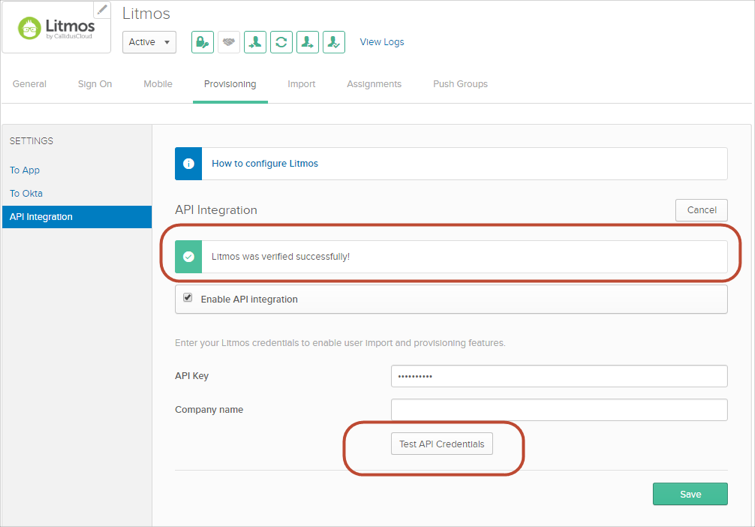 API Key: Enter the API key you copied from Litmos (see Requirements above). Also, make sure that your AccessLevel is Administrator or Account Owner. Company: Enter your company name. This is used to identify you in Litmos. 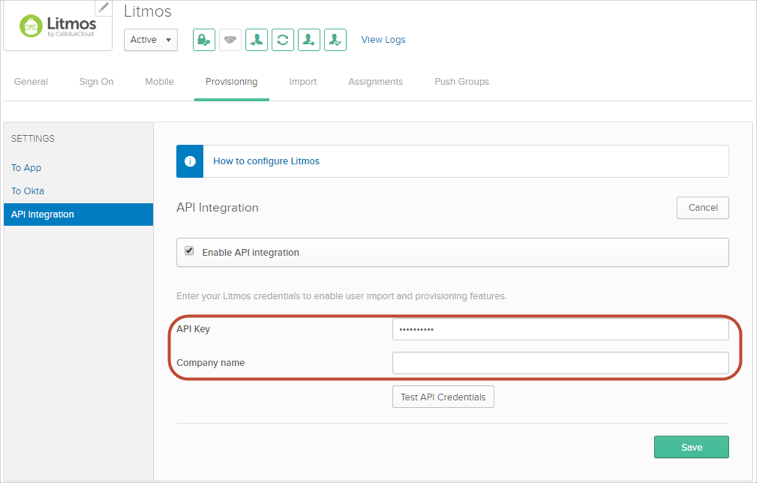 You can enter any value that identifies your organization in Litmos. You can now assign people to the app, if needed (see below). Click the Save and Go Back button. Note: The user must be assigned to the course or learning path in order to access it directly. If they are not assigned to the Learning Path or Course directly, they will receive a "Invalid Access" error message.